The Quantes is a laboratory-based instrument used for performing both traditional XPS measurements using an Al Kα X-ray source, plus extended depth of analysis experiments using a Cr Kα (hard) X-ray source. The latter is referred to as HAXPES – Hard X-ray Photoelectron Spectroscopy. The Cr X-ray source provides for depths of analysis roughly 3 times those obtained using an Al X-ray source. The Quantes is based on the tried and true Quantera XPS platform. Dual monochromatic Al Kα and Cr Kα with scanning microprobe functionality. High sensativity optimization analyzer with 3X transmission gain. X-ray induced secondary electron imaging (SXI). 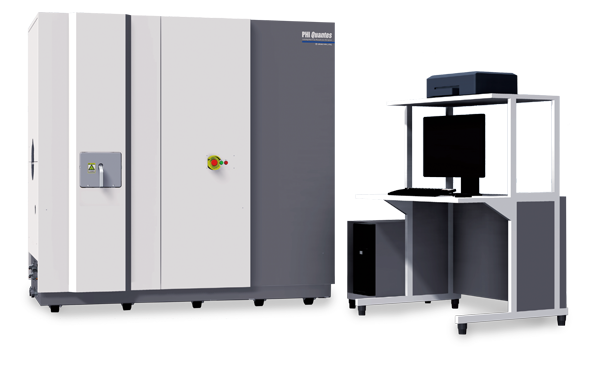 Multi-point spectroscopy and depth profiling with a user defined x-ray beam size. XPS mapping with spectra at every pixel. HAXPES using Cr x-rays offers 3× greater depth of analysis compared to conventional XPS. HAXPES information depth from the surface of solid samples is larger than conventional XPS as kinetic energy of core photoelectrons are excited. Traditional electron flood gun charge neutralization is not effective in neutralizing the localized positive charge created by the X-ray beam because the samples static charge interferes with the low energy electron beam. PHI’s patented dual beam charge neutralization is a reliable and hands free method that uses a low energy ion beam to eliminate the samples static charge allowing the low energy electron beam to reach the sample and neutralize the localized positive charge created by the X-ray beam. Si 2p photoelectron line shows a native Si oxide at the PMMA/Si interface, and is observed even in the 35nm film sample when using HAXPES. Using HAXPES on this multilayer thin film enables the detection of all the components in the stack, and HAXPES shows the buried Cr layer to be partially oxidized.